The 2018 PRWeek Awards showed a tremendous diversity of work and practitioner that bodes extremely well for the future of the profession. A packed room at Cipriani Wall Street celebrates the 2018 PRWeek Awards. 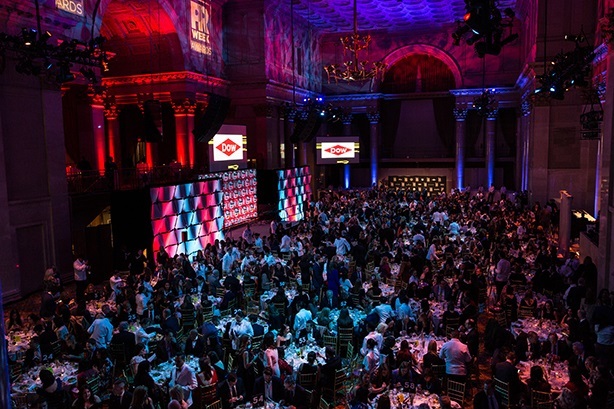 Last night’s PRWeek Awards ceremony was one of the best yet, with just the right mixture of excellence, creativity, inspiration, leadership, and celebration. From the stunning set to our engaging new hosts and singing sensations Geoff and Andre to the packed room at Cipriani Wall Street, assembled guests were worked up into a frenzy of excitement before an award had even been presented. Our choice of #MeToo movement catalyst Tarana Burke as PRWeek Communicator of the Year clearly resonated with the mood in the room and tapped into a zeitgeist that is particularly poignant for a profession that is 70% female. In her absence, Burke’s award was accepted by Chelsea Fuller, senior communications manager at Blackbird, a strategic comms firm specializing in racial and social justice organizations – including #MeToo. Fuller described how Burke was nonplussed by the description of her as a great communicator, demonstrating a humbleness that is one of the reasons #MeToo has taken off in such an authentic and transparent manner. But, in a few years, I suspect we will look back on the rise of #MeToo as a defining moment- and movement – that genuinely changed society for the better and ushered in a new age of equality. For that Burke deserves every piece of credit coming her way. The celebration of our 2018 Communicator of the Year set the tone for an evening where several other campaigns revolving around social issues rose to the top. A recording studio in the back of a truck was the focus of Mobile Stü, winner in the Best in Community Relations category. The activity aimed to improve relations in Boston between black communities and the police, aided by creative firm Allen & Gerritsen. State Street’s Staring Down Wall Street: Fearless Girl activation is familiar to most people now, and it took home the Best in Financial Communications prize. Best in Public Affairs was FWD.us and FP1 Strategies’ work on selling reform of the Louisiana Criminal Justice System and highlighting disparities between African-Americans and Caucasians on the fairness of the system. Edelman teamed up with One Orlando Alliance to create a unifying nonprofit to meet the needs of the LGBTQ community in the Florida city following the horrific terrorist attack on the Pulse nightclub in June 2016. This work in creating a voice after a tragedy won the award for Best in a Crisis. Edelman also scored in the Best in Public Sector category for activations around the Department of Defense Warrior Games that rallied support for the wounded, ill, and injured service members and veterans participating in the games. Best in Nonprofit went to International Rescue Committee for its refugee resettlement campaign and Best for a Cause was won by the National Sikh Campaign and FP1 Strategies for telling the Sikh American story. Best in Broadcast/Film/Video was won by Save the Children and Weber Shandwick, for its poignant Unboxing the End of Childhood film. For those naysayers who complain the PRWeek Awards are simply a vehicle for celebrating big PR firms or large brands and organizations, this year’s event again proved the lie to this ill-informed statement. C+C won Outstanding Small Agency as well as Best Promotional Event for its work on the great American eclipse flight. It also snagged an honorable mention in the Best in Public Sector category for its efforts on behalf of the Washington Traffic Safety Commission. Other smaller firms winning included the aforementioned FP1 Strategies and Allen & Gerritsen, as well as Cunningham Collective, Highwire PR, Manifest New York, and Adam Ritchie Brand Direction. The winner of the Outstanding In-house Team award went to the two-strong scrappy outfit at internet performance and security company Cloudflare. Then, of course, there were big brand activations such as the excellent Campaign of the Year, Frito-Lay North America and Ketchum’s Tostitos Party Safe Bag, which really sparked a conversation around the important topic of drink-driving through a creative and innovative packaging design that pushed people who had been drinking toward Uber. Great work. Important topic. Weber Shandwick’s work with GSK Consumer Healthcare’s Excedrin brand on The Debate Headache was particularly noteworthy; Weber also won for its Hit by a Bolt campaign for Chevrolet. It also annexed Large Agency and Agency of the Year for an unprecedented fourth time in a row. Sister IPG firm Golin won in the Best Content category for its theSTRAW work for long-time client McDonald’s. As Andre sung us out with an entertaining ode to PR, it felt right to reflect that these winners demonstrated the breadth of expertise, creativity, and skill in the modern PR industry from top to bottom, and showed why we should be optimistic about the future contribution of the PR craft to businesses, organizations, and movements alike.